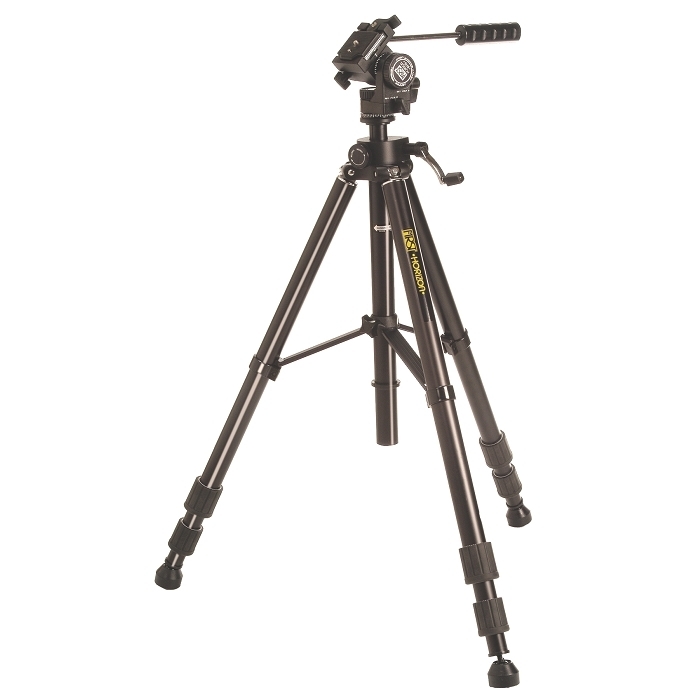 The Horizon 8115 Tripod is a robustly constructed model that combines excellent stability, with precise control, and is ideal for a wide variety of imaging equipment. Comfortably manages all Spotting Scopes and Observation Binoculars of up to 100mm Diameter. Can be used effectively indoors, or in the field. Recommended for Serious Nature Observing, Astronomical Observing and Video applications. "I bought this tripod to use with a pair of Celestron 25x100 binoculars as well as to provide a good sold support for my camera for wide field astrophotography. I have now been using it for 2 months and I am well pleased.It is solid and well made, the centre pole is stable even when fully extended. This was a big test for me as the 25x100's are big heavy beasts. Following any movement the vibration dampened down very quickly. Even at hih angles there as no feeling that set up would topple back. Fully extended the height is good enough to allow comfortable viewing at angles up to 60°. If I needed to go above this I positioned the legs so that there were two to the rear and then tipped back the whole system like a giant monopod...it worked really well. However I can still see the need for a pantograph mount at a later date. With my camera it provides a super stable mount. I am also going to use it with my Nano-tracker. All in all I am well pleased with this piece of kit, it will work well with binoculars of 100mm and below."